- When instructing the child, slip in the phrase "because Imam Mahdi is watching and will choose a helper who does this". Much better than 'look, that aunty is watching and she'll get angry'! - Instil in the child that there are times when Mummy and Papa won't always be there for you but Imam Mahdi will and always is! - Have the child write down their hajaats and look back at them the following year. This helps them remember that their dua was granted insa. - start a special journal especially dedicated to the Imam where every Friday the child writes a good deed they have done that would make Imam happy. 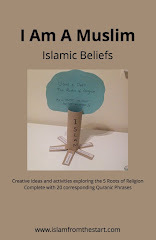 Have them gift this to the Imam and once the habit is established you will find children eagerly anticipating to write their good deeds 'to show Imam'.